Films that feature a "movie within a movie" more often that not come off looking more like a "movie without a movie." Several, such as Robert Altman's The Player and Frank Oz's Bowfinger hit their mark and become delicious pieces of satire about the motion picture industry. Others miss the mark widely and are relegated to the 99-cent bin at the local Blockbuster. 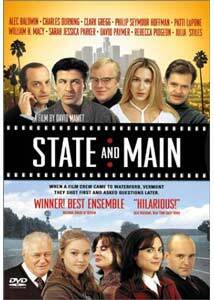 David Mamet's State and Main falls luckily into the former category. It is a smart, biting comedy that ranks as one of the funniest films of recent years. When the production of a film titled "The Old Mill" settles on Waterford, Vermont, as a replacement for another town they were forced to leave, everything seems to be going as planned. The town has the two required locations—an old mill and a vintage firehouse—and the people in the town seem to be welcoming the production with open arms. Director Walt Price (Macy) is soon forced to make changes when he discovers the old mill actually burned down several years ago. Then, his star actress won't show her breasts for the film, even though, as Price claims, "The entire nation could etch them from memory." The film's screenwriter, Joseph Turner White (Hoffman), is being forced to compromise his script due to budget and practical considerations, not the least of which is that without the old mill, his script is in need of a new title. And on top of everything, he begins to fall in love with a bookstore owner named Ann (Pidgeon). On the other end of the love spectrum is the big star, Bob Barrenger (Baldwin), who immediately falls for the first girl he sees, who just happens to be a teenager (Stiles). David Mametdeserves much of the credit for the success of State and Main. Mamet, who also wrote the screenplay, wisely chooses to keep from making the film a fish-out-of-water comedy, and instead makes both world so very different that the clash results in great moments of farce. While it should come as no surprise that Mamet's writing in the comedy genre is every bit as good as his more dramatic and thrilling scripts, what is surprising is his direction of the more humorous scenes. Mamet, who directed one of my favorite thrillers of the past five years, The Spanish Prisoner, paces the film with great energy, never letting the scenes drag or the humor fade. Even more impressive is his ability to slightly refrain from his trademark use of staccato, obscenity-laced cadence, as in his Glengarry Glen Ross (high on the list for most uses of the word f*** in a motion picture). He tones down his dialogue here, but his barbs can still be felt in full force. Several lines are instant classics, such as Macy's quote, "Its not a lie, its a gift for fiction," or my favorite moment, a brutally funny rant by the David Paymer character. It is perhaps the Mamet's greatest accomplishment that he realizes people can have conversations just like the ones scripted in State and Main. Most other screenwriters have a knack for creating dialogue that would never be spoken by a sensible human being. The ensemble cast features a large number of terrific performances with even the smallest of supporting players hitting the right notes. William H. Macy, a Mamet regular, has fun with the writer's words and brings the right levels of humor and sympathy to the table. Both Alec Baldwin and Sarah Jessica Parker, two actors I normally dislike immensely, are fine as the two stars of the film-within-the-film, and each of their performances has the right amount of over-the-top delivery that make it work. Philip Seymour Hoffman and Rebecca Pidgeon (Mamet's wife) have splendid chemistry together as they create a believable and sweet romance. And in my favorite performance, David Paymer plays something other than his usual tough, profanity-spewing Hollywood performances. It is a shame that his performance here was overlooked in the awards season. Image Transfer Review: Featuring both an original 1.85:1 anamorphic widescreen transfer as well as a full-frame version, State and Main looks fantastic. Once again, New Line comes through with a beautifully detailed and clean looking transfer. Sharpness is perfect and black levels are well done with nice depth. Fleshtones come off looking natural. The only problem that I noticed worth mentioning is a few short moments of edge enhancement. Other than that one thing, this is a wonderful looking transfer. Audio Transfer Review: With a Dolby Digital 5.1 mix that is better than most other comedies, the audio for State and Main is a pleasant surprise. The musical score by Theodore Shapiro has a wonderful big band/jazzy feel to it that fills the room and speakers wonderfully, especially in the opening credits. Dialogue is easily understood and is never harsh or muted. Ambient sounds give the surround speakers some activity, but like a truly great mix they never call attention to themselves. A nice mix from New Line. Extras Review: This disc features a commentary track by David Paymer, William H. Macy, Sarah Jessica Parker, Clark Gregg and Patti LuPone. The track is a mixed bag as both Macy and Paymer have a lot to say about working with Mamet and also share their thoughts about the film itself. Macy comes across as the most humorous of the group, which is not surprising. Overall this is an enjoyable track, just not as good as it had the potential to be. Cast and crew bios as well as the very funny theatrical trailer round out the extra features. I love State and Main for every reason that I can think of. The directing, writing, and acting are all excellent. A definite buy for Mamet fans—hell, it is a must buy for anyone. Highly recommended.